To ensure maximum uptime, we have made a fully redundant network. In the event a router goes down, all data is re-routed to our backup router. lso if there are any upgrades to be performed to the primary router, the econdary router takes over to ensure no downtime is experienced. in the event the path is blocked between us and it's destination. 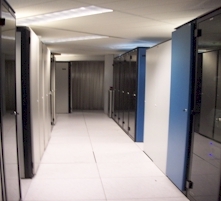 The Data Center is located in the Equinex Data Centre in Sydney. UPS is faulty it automatically switches over to a second UPS. days before refueling. The system is tested and maintained monthly. puts out the fire before spreading and is harmless to humans and electronic equipment. to be around evenings and weekends. We're here to help, because when you succeed, we succeed.